By Wayan Vota on October 15, 2014 | Comments Off on How Can We Use Drones for Development? We all know the military and surveillance applications of drones, and we can dream of Amazon Prime Air, but how can unmanned aerial vehicles (UAVs) be used to improve peoples’ lives? What innovations with remotely piloted aircraft will accelerate social and economic development? Could we deliver medicines or vital packages via drone? What about finding poachers and polluters from the air? Or monitoring the impacts of deforestation and climate change? And could we speed up disaster response and humanitarian aid? 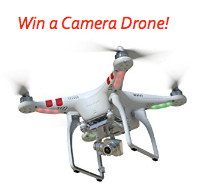 To spur creativity and innovation of drone use, we will be giving away a DJI Phantom II Quadcopter – the #1 recommended camera drone – to the Salon participant with the best drone use idea. Please be sure to suggest an idea when you RSVP. Before we get too frothy with excitement, drones also have many negative connotations. What might people under drone flight paths think? How might they, or you, respond to a drone overhead? The answers to these questions matter as well. Please RSVP now to join your peers to examine the current and potential role of drones in development. We’ll have hot coffee and catered breakfast treats for a morning rush, but seating is limited. Once we reach our 35-person capacity there will be a waiting list!